At the end of each The Walking Dead comic issue is a "Letter Hacks" section, in which the writers (especially Kirkman) reply to fan letters about how they develop the comic, some worldbuilding, what may happen in the next issues... And sometimes the truthfulness of these statements has to be taken with a grain of salt. "The name of the game as a writer is not limiting yourself for the future," Kirkman said. "In my opinion, at least. I'd never answer this [how many people are left] in a letters column because if later I decide they're going to find a place with millions of people, you can say, 'No wait! In the letters column for #177 you said this!' I also intentionally mislead in the letters column from time to time to steer eagle-eyed readers away from the upcoming plot threads. That's fun. At some point someone should take it upon themselves to read all the Letter Hacks over the years and see if they can figure out when I knew of an upcoming storyline and was clearly misleading people, and when I just changed my mind or came up with a new idea." Negan is NEVER getting out of that cell. EVER. Sorry. MACKIEWICZ: You're a goddamn dirty liar, Robert. Last issue you wrote: "Negan is NEVER getting out of that cell. EVER. Sorry." Sooooo... unless this is some early onset something or other... You're a goddamn dirty liar. BUT Negan's out, which will make all the Hacks lunatics ecstatic for a number of perverse reasons, which they're already writing and sending WITHOUT proofreading. ... I guess this is going to be the tone of Hacks this months. Roll with it. KIRKMAN: Listen, in my opinion, there's a special kind of devoted reader who pours through Letter Hacks each and every month. And those readers... I like to enhance the experience for them as best I can. Sometimes it's by lying about a thing I know is coming VERY soon, other times it's by seemingly spoiling big things which sometimes come to pass... and sometimes don't. It makes things more fun! So read Letter Hacks, people! You never know what's going to happen! Based on this example and the quotes above, this might not be the only time Kirkman pulled such a move. 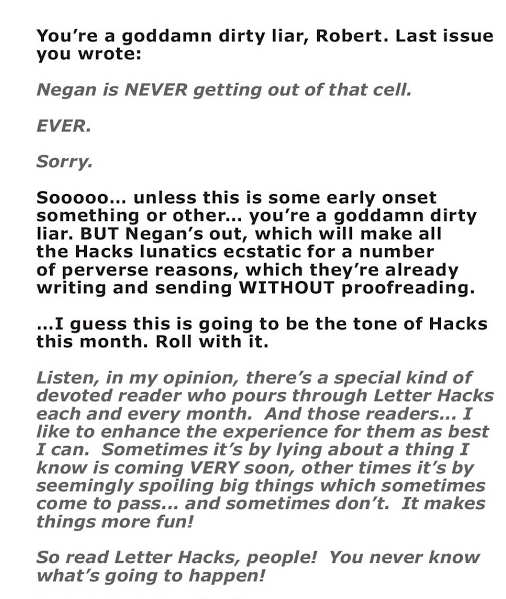 So how many times has Kirkman outright lied in a "Letter Hacks" section? To clarify, I mean what the guy said above, he knew of an "upcoming storyline and was clearly misleading people" (so not the "the TV show is great" lies Reddit is fond of), such as Negan getting out of jail. I also know there are conflicted statements about the milestone #200 issue, but as it's only going to be released in about a year, let's not consider this one right now. Browse other questions tagged comics the-walking-dead or ask your own question. Why does Andrea later look like Amy in The Walking Dead comics? How much time has passed in the Walking Dead From Book 1 to 94? In The Walking Dead, how is Herschel walking without crutches? Do the cast members of The Walking Dead read the comic books? Walking dead: why there are so many walkers around? The Walking Dead: Wifi & Pilots? Has The Walking Dead ever done a crossover with another comic?